I mentioned a million years ago (when I was like 8 weeks pregnant and sick as a dog so I refuse to link to the post/photo) that my hair decided to go completely haywire when we moved to Maine. For my entire life, I've battled my olive skin which creates a typically oily t-zone and hair situation. Like, hair washing every single day, use oily hair shampoo (which is hard to find) and carry dry shampoo in my purse in case I have plans after work kind of hair. Super glam. Especially as an adult. Anyway, when we moved here the extreme change in weather and water completely dried my hair out (my sister in law pointed out that the pregnancy hormones probably had a hand in mixing things up too...I was too busy vomiting to really put all that together, but I bet she's right). I have to admit, I was pleased. Dry hair seemed to have a million more solutions in the shampoo aisle at Target than limp, oily hair. It took some time but I've finally figured out my daily hair must haves to combat the dryness while styling. I really don't enjoy spending a ton of money on shampoo and conditioner (in fact, until now, I never spent money on conditioned because I never used it. Ever.). 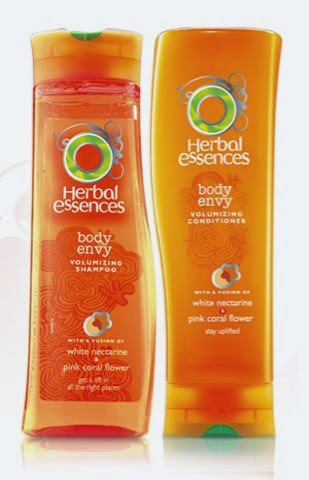 I've been pleased with the Body Envy line from Herbal Essences. The conditioner is lightweight and the shampoo leaves my hair residue free and smelling like citrus. Because old habits die hard, I still only apply conditioner to the bottom half of my hair (from the neck down). That's the section that takes the most abuse from my current styling routine and I just can't imagine slathering conditioner on my scalp. 30 years of habits are hard to break! Another habit I had a hard time breaking was the daily washing. My husband will laugh at this and say I'm just lazy, but I've made a conscious effort not to shampoo and blow dry everyday. I'm a big dry shampoo fan (I think I've reviewed 3 or 4 brands on the blog) and I recently abandoned my old Suave go to for the Herbal Essences Naked Dry Shampoo. The main reason it's my new fave is the lack of a white residue left behind on my very dark brown hair. The Naked sprays clear and saves me the step on vigorously rubbing my part to hide the evidence of the dry shampoo spray. The Naked smells fresh but not strong and while I prefer the smell of the Suave, it doesn't outweigh the white part issue. 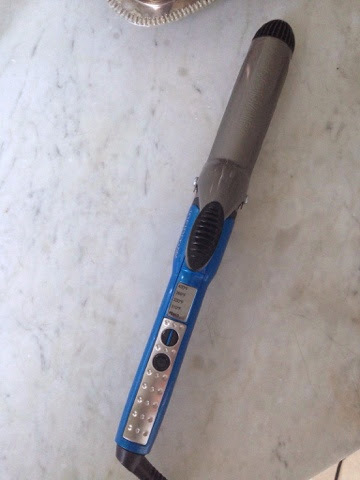 The Infiniti Pro by Conair is my go to curling iron these days. The barrel is 1 1/2 inches and the selling feature for me is the heat control. I can crank up the heat and curl my hair in record time. I use this iron to get the big curls you normally see in all of my Bumpdate pics (my most put together day of the week). Ok, this is the Southern girl in me, but I usually give my roots a little extra bump with a bit a of teasing. You know, jack it up to Jesus and all that Southern hair business. 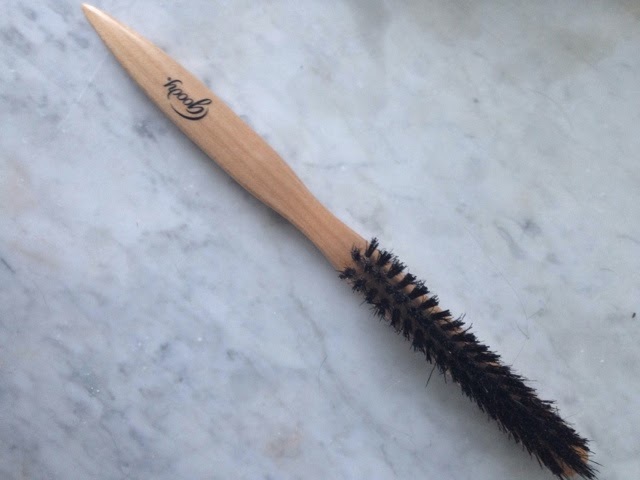 Anyways, I just snagged this Goody brush for like $3 and I love it. Plus it's tiny enough to fit into my clutch for a night out. 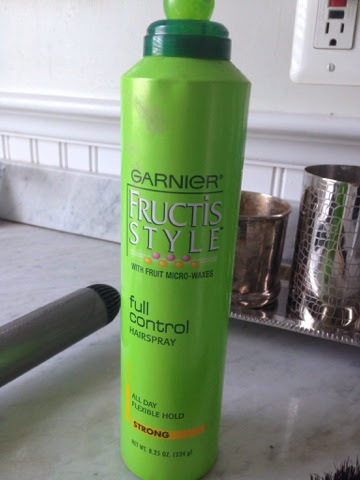 As you can tell from the beat up nature of this Garnier Fructis Full ControlHairspray, I use it a ton. I typically flip my head over after curling and just mist the hairspray over the curls. The spray is light, non-sticky and doesn't weigh down my curls. The hold lasts through the day but doesn't leave my hair looking like it's been sprayed to death. Who knows what will happen when this baby comes (I'll probably end up bald and greasy) but for now, this is what's working for me day to day! Thank you for sharing your hair routine! It's refreshing to see reviews of reasonably priced products! 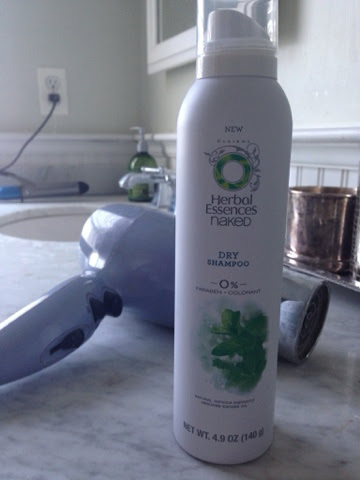 I recently tried the garnier dry shampoo and love it. I am hooked on the suave as well (tried it after your review). I am anxious to try the herbal essence version as well now! I was the same way with washing everyday, but I have noticed my hair gets used to not being washed every day and it gets easier. I don't know what I would do without conditioner - I glob that ish on my hair. I think it's time to leave behind Panteen and onto something more expensive. My hair is quite the opposite of yours and the bottom due to bleach is dry as a bone! I'm like Laura, I go through SO much conditioner. Like, 2 mammoth bottles a month. I'm super jealous your hair doesn't require tons of expensive products and looks perfect!